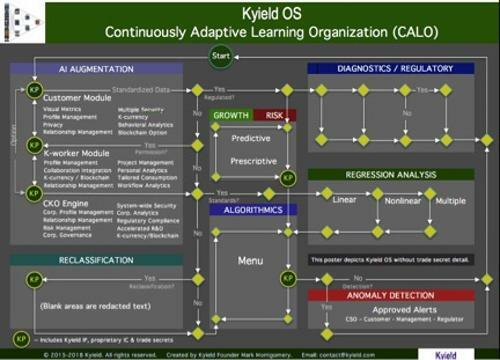 The KYield operating system is based on the theorem ‘yield management of knowledge’ developed by KYield’s founder in 1997. The KYield OS provides optimal network management at the confluence of human and machine intelligence. The patented AI system core is fully adaptive and tailored to the unique profiles of each entity with a simple natural language interface. Among many benefits of the KYield OS include data optimization at vast speed and scale that delivers enhanced governance, security, prevention, productivity, innovation, discovery, and continuous learning for each individual, team, and organization. Data ownership and control remains with customers unless required by regulations or per agreement.